1. A parallel plate capacitor is connected to a battery of potential V. The distance between the plates is doubled without disconnecting the battery. Which of the following is true? a. Both the capacitance and the charge on the plates are decreased by one-half. b. The capacitance is decreased by one half, but the charge on the plate is unchanged. c. The capacitance is unchanged, but the charge on the plates is decreased by one-half. d. The capacitance is doubled, and the charge on the plates is unchanged. e. Both the capacitance and the charge on the plates are doubled. 2. Two large, flat, parallel, conducting plates are 0.04 m apart. The lower plate is at a potential of 2 V with respect to ground. The upper plate is at a potential of 10 V with respect to the ground. Point P is located 0.01m above the lower plate. What is the electric potential at point P? 3. A point P is 0.50 meter from a point charge of 5.0 X 10^‑8 coulomb. 5. The capacitance of a parallel-plate capacitor can be increased by increasing which of the following? Two charges are situated as shown. 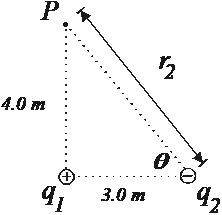 The distances are given in the drawing. The charges have the following values: q1 is 5.0 mC and q2 is -2.0 mC. (a) Find the potential difference at point P.
(b) How much work is required to bring a third point charge of 4.0 mC from infinity to P?